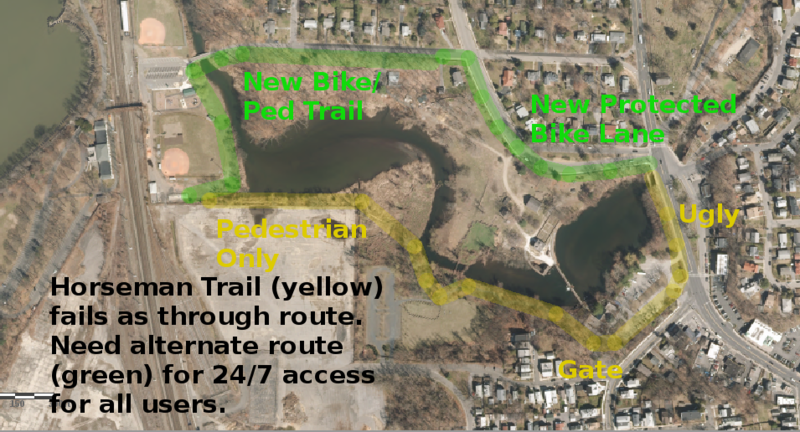 Many residents requested better biking and walking infrastructure while at the 5/29/18 Comprehensive Plan meeting. Nice meeting you both at the 5/31 meeting in Sleepy Hollow. Been composing this since then. There's more to say, but want to get this out the door before the next meeting. The overall study's website is http://www.route9active.org/ , though there's not much there. The consultant, Nelson\Nygaard, is working on the final plan view drawings. [On the right] is a collage for some inspiration. While RiverWalk on the waterfront is/will be a nice path, it's a meandering recreation facility where people walk. Cycling on it is slow and out of the way. 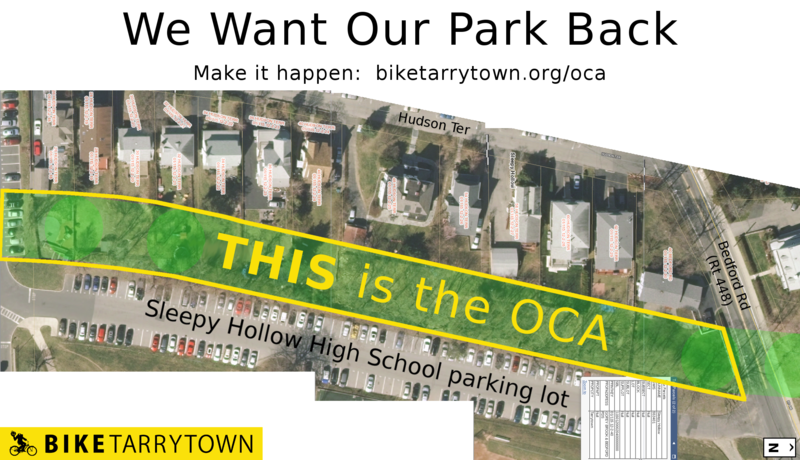 The Sleepy Hollow - Tarrytown Trails Committee (of which I'm a member) is working to design direct connections between Edge-on-Hudson and the two train stations. Scenic Hudson (which chairs the Trails Committee) is applying for a grant to figure out how to implement this. River St was intentionally built narrow to encourage driving at reasonable speeds. Unfortunately, the sidewalk is narrow and there's no room for protected bike lanes. Improving this situation will likely look for space from the old DPW property. In EOH itself, Bike Tarrytown encourages the western side of Legend Drive (called Road Four during the planning process), presently slated to be car parking, be a 2-way protected bike lane. This will create a safe, direct spine for people traveling in and through EOH. The Headless Horseman trail on south side of Pocantico River is nice, but not a useful connection. Here's how to make a 24/7 connection. This is a piece of the East Parcel and Route 9 concepts mentioned above. Home owners on Hudson Terrace have taken over public land. State Parks confirms none of them have agreements with the State to do so. This forces people to walk and bike through the High School parking lot. Parking lots are dangerous places. The Village / State need to rework the OCA / Gorey Brook Rd crossing. Cars park all over the right of way. 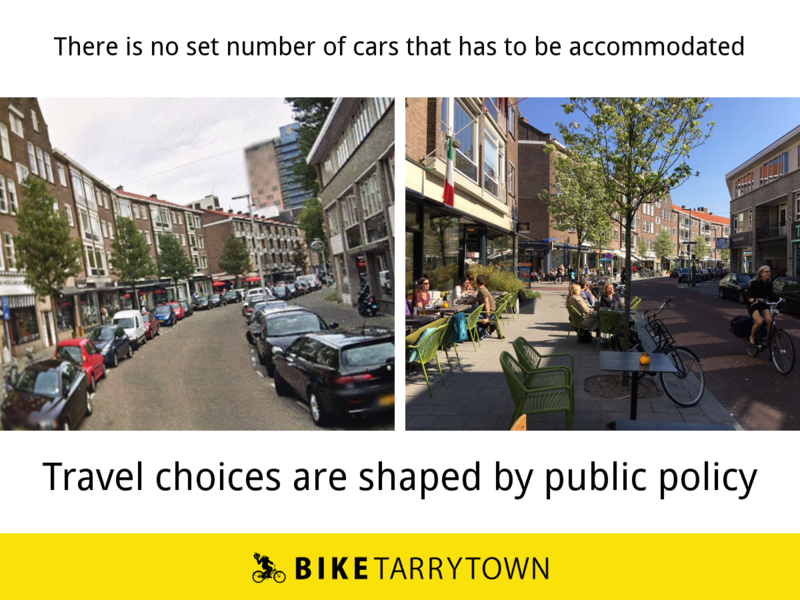 Need to create dedicated space for walking and cycling. The Village needs to create a plan to complete our sidewalk network. The plan should create a scoring system to determine the order to implement everything in. Key considerations would be connections between neighborhoods, vehicle volumes, etc. 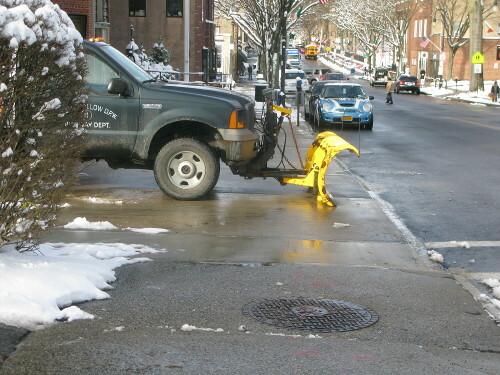 Some locations have car owners parking their vehicles in ways that block sidewalks. 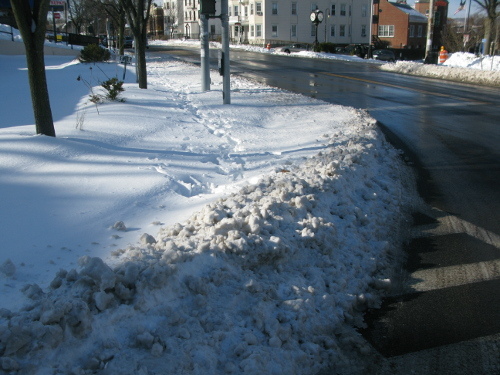 The Village needs to take education and enforcement measures to ensure walkways are clear. 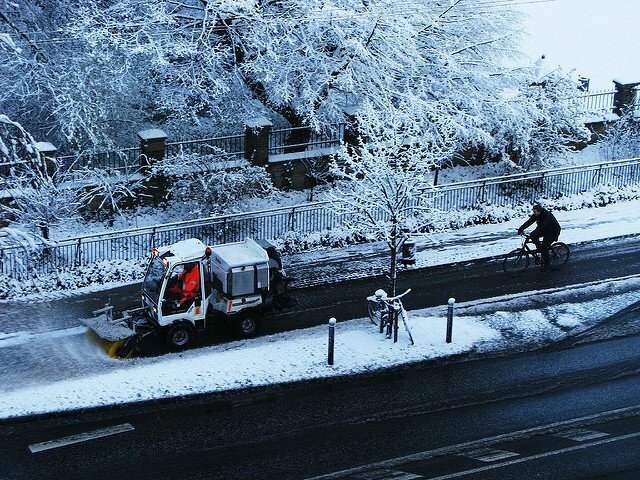 Not only do bus stops and crosswalks often not get cleared, they sometimes get snow plowed into them. 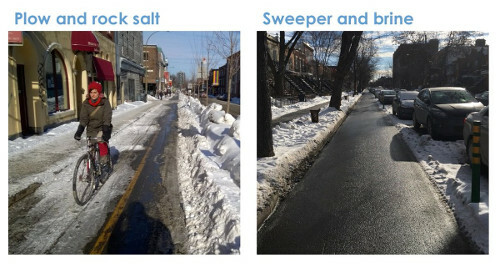 Montreal is an excellent example of municipal sidewalk snow removal. To remain within New York's tax cap, the process can be funded via a separate small fee, like garbage collection is. As a member of the Environmental Advisory Committee, I put the following presentation together with Claire Davis (the Committee's Co-Chair). Contains recommendations on how to make walking nicer and safer on Valley St, Cortlandt St and parts of Beekman Ave.
15 minute headways on the Route 13 Bee-Line bus. Work with the County and municipalities along the route to fund the enhancement. It connects Phelps, the Manors, Inner Village, Tarrytown and White Plains. Short headways dramatically boost utilization because people don't need to worry about the schedule. Better reroutes and notification are necessary during parades. During some events, bus passengers are sent up to the lakes, missing the Tarrytown train station and the downtowns of both Villages. Others are just rerouted to Broadway. No signs are placed at bus stops indicating the change. Northbound buses should take Pocantico St. Southbound buses should take Pocantico, turn right on Beekaman Ave, left on Cortlandt St (set up temporary lane or flagging for contra flow), left on Chestnut St, right on Valley St to resume normal route. 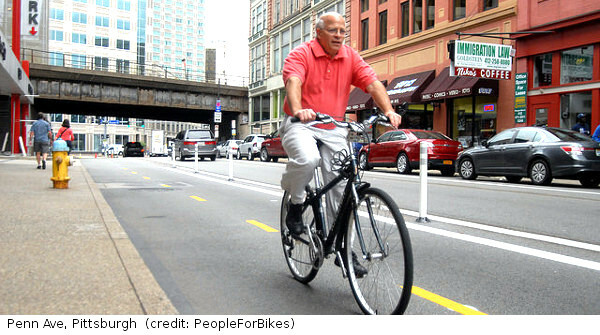 Safe bike infrastructure network. Considering the farthest points in the Village are just 2 miles apart, connecting key origins and destinations with protected bike lanes and traffic calmed streets will provide residents with quick, cheap, efficient on demand access. Complete the sidewalk network. As mentioned earlier, several locations in the Village lack sidewalks, hindering the ability of people to safely travel on foot. Properly pricing parking. We subsidize driving by giving away public space, in most places and times for free. Where meters or permits are used, the pricing is too low to have much influence. Meters are $0.50 / hour, both on street and off. Philipse Manor station's permit is only $450/yr ($1.80 per work day). With that in mind, an analogy... If the Village started giving away ice cream, but didn't have enough on hand to meet demand, would people start complaining about our "ice cream problem?" More Comp Plan information is on our Sleepy Hollow Comprehensive Plan Home Page.